Take the TEDx style format and combine with Rocks Digital enthusiasm, and you get Rocks Talks. 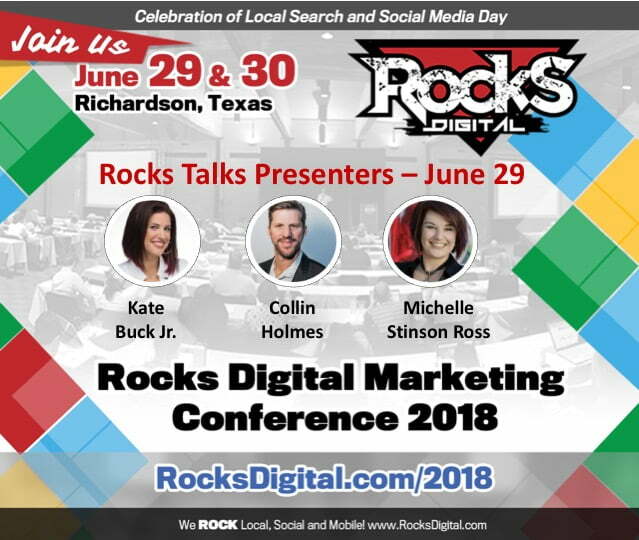 These high-energy presentations will teach you what you need to ROCK local, social and mobile! Rocks Talks are so popular that this year, we’re doing three on each day! Liven Up Your Brand with Facebook Live, presented by Kate Buck Jr.
Click the presentation summary below to read the speaker bio and full presentation description. 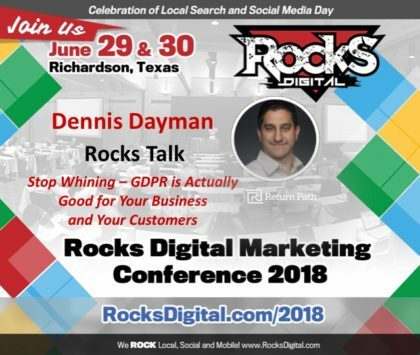 Dennis Dayman, data privacy expert, to present a Rocks Talk on why GDPR is actually good for your business and your customers on Social Media Day at the Dallas-based 2018 Rocks Digital Marketing Conference. Meet Dennis now. 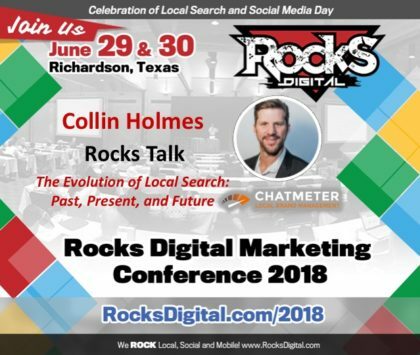 Collin Holmes, founder and CEO of Chatmeter, to present a Rocks Talk on The Evolution of Local Search: Past, Present, and Future at the Dallas-based 2018 Rocks Digital Marketing Conference. Meet Collin here. 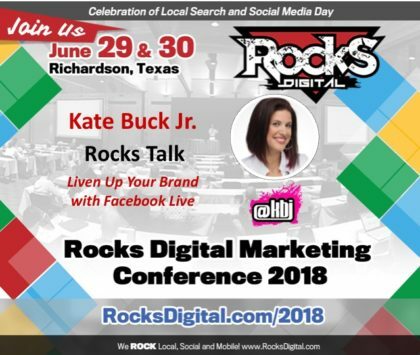 Kate Buck Jr., creator of Social Media Pro, to present on Liven Up Your Brand with Facebook Live at the Dallas-based 2018 Rocks Digital Marketing Conference. Meet Kate here. 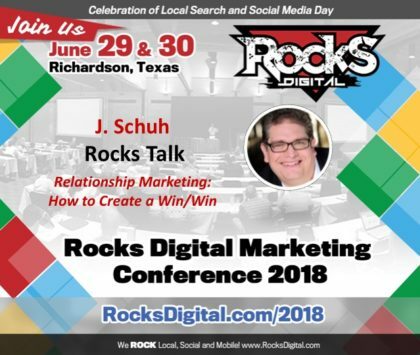 J. Schuh to present a Rocks Talk on "Relationship Marketing: How to Create a Win/Win" at the Dallas-based 2018 Rocks Digital Marketing Conference. Meet J now. 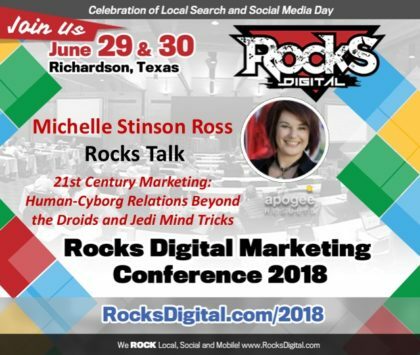 Michelle Stinson Ross to present "21st Century Marketing: Human-Cyborg Relations Beyond the Droids and Jedi Mind Tricks" at the Dallas-based 2018 Rocks Digital Marketing Conference. Meet Michelle now. Tyler Sickmeyer, Marketing Thought Leader, to present a Rocks Talk on "How to Drive True Customer Engagement in an Ever-Changing Social Landscape" at the Dallas-based 2018 Rocks Digital Marketing Conference. Meet Tyler now.